DrawMeIn: Have you ever been asked before to draw someone in (other than I)? (Although I know you have, in the very issue I am) How do you respond to this? Freddie Williams II: I usually say if I can add any extra in the background I will try to fit them in. DMI: How about when I asked? Freddie: To you, I thought it was a cool idea and since in the past only people who know me have been put in. I thought it was a bit different to see someone going around with flyers trying to get drawn in. 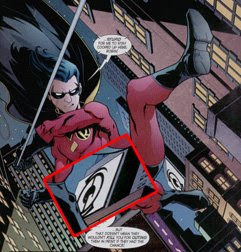 DMI: What are some of the coolest/weirdest things you've snuck into a comic, "Easter eggs" if you will? Robin #161 Pg. 21 – where the bad guys are dissolving on the floor in the far left side is a caution wet floor sign I stuck because I thought it was funny. DMI: How are your convention experiences normally? More specifically with the fans? Have any recent stories to tell? Freddie: We’ve always really enjoyed ourselves, the cons themselves are a blast most of the time it’s the paperwork end and dealing with the people in charge that can be a hassle. But we really enjoy seeing all the people in costume. We saw some of the cutest Robins in San Diego on a couple Kids. We got a couple pictures of them because they were just too adorable. DMI: Lastly, how cool is it to work from home and to draw comic books? Freddie: It’s really cool, a dream come true for me, so even though its hard work and at times came be an endless stream of work I love it and wouldn’t want to be doing anything else. DMI: How much time do you devote in a days work? Freddie: My usual work hours consist of 12 – 15 hours a day, with very little exceptions. DMI: What time of day do you prefer to work? Freddie: I’m more of a night owl, so I work late. I usually don’t get to bed till 2 or 3 am and sleep till about 8 or 9am. That’s my typical day. How easy is it to get distracted? I usually don’t get to distracted – I can stay focused on what I am doing. I try to avoid games/ movies I haven’t seen so I won’t get caught up in them. I usually listen to music or youtube stuff while working. So I work and learn at the same time. My wife does pretty much everything else around the house, and dealing with errands so I can focus on drawing and not much else. Eighth Appearance! Supergirl #34 by Jamal Igle!